These items are either sold out or we have only one of each available. However, we can obtain more of them by special order. If you are interested in any of these items, then please send an email to shop@finnishspitzsociety.co.uk and start your email with the words FSS Shop. We will then tell you the likely date that we could send them out by and will confirm the price for the items and the postage & packing costs. We will also send you a PayPal link for the total sum due but there is of course no obligation to continue with the order. Hand-made from curly birch by Wood Jewel in Northern Finland. The dog (standing) is much smaller and lighter than those on the other curly birch products. A black rubberised chain is attached (length 23 cm). - Standing dog - 2 x 2 x 0.5 cm, weighs around 1 gram. The very elegant Finnish Spitz clock is designed and made in Finland by Veico out of local birch wood. The size of the clock (in a protective cardboard box) is 23 x 24 x 5 cm and it weighs 469 grams (in the box). 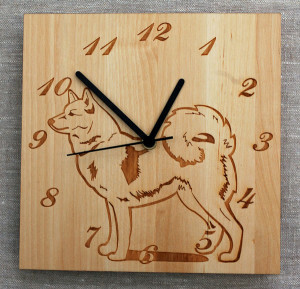 The clock is square and is cut out of solid birch with the image of a Finnish Spitz and the hour numbers burned into it. The surface is treated with a natural wood oil to keep the dirt off. On the reverse side is the clock mechanism which operates quietly with one AA battery (not supplied). This is a set of 2 kitchen items – a bag closer and a pot watcher made in Finland by Veico out of local birch wood. 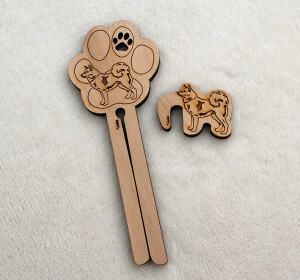 Both items have the image of a Finnish Spitz burned into the wood (slightly smaller than the image on the keyring). The items come with a descriptive card (Bag closer - “I keep the bag tightly closed to preserve the flavour”, Pot watcher - “Put me under the lid to keep your pot from boiling over”). The card and 2 items are sealed together in a plastic wrapper. The package size is 20 x 9 x 1 cm and it weighs 32 grams. The Finnish Spitz pot stand is designed and made in Finland by Veico out of local birch wood. The size is 20 x 20 x 1.5 cm and it weighs 220 grams. 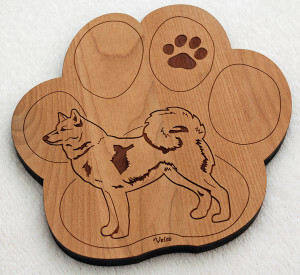 The pot stand is cut out of solid birch in the shape of a dog paw with the image of a Finnish Spitz and paw burned into it. It has been treated with a darker coloured wood oil to keep the dirt and water off. Although designed for practical use in the kitchen, it could be also used as a nice wall decoration with a small hook attached!